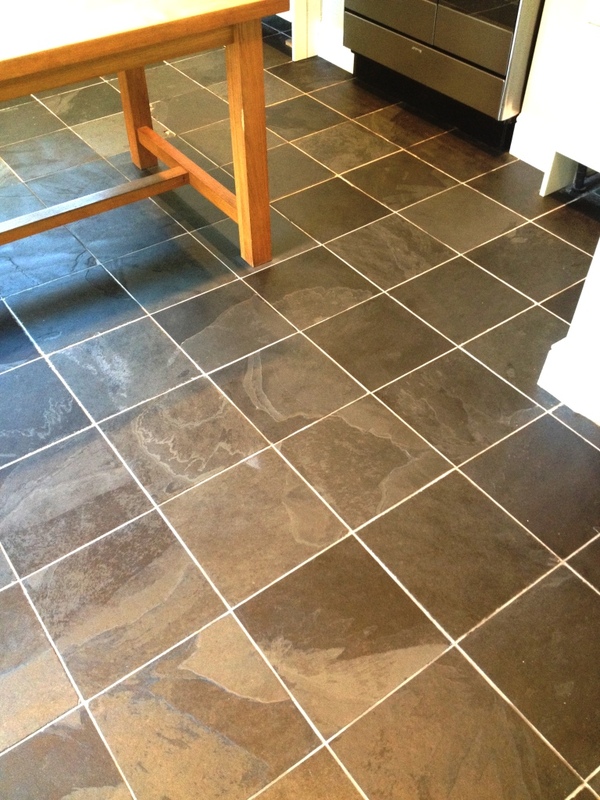 Slate tiles have been in use for centuries, often chosen for roofing and both interior and exterior flooring due to their hard-wearing nature. 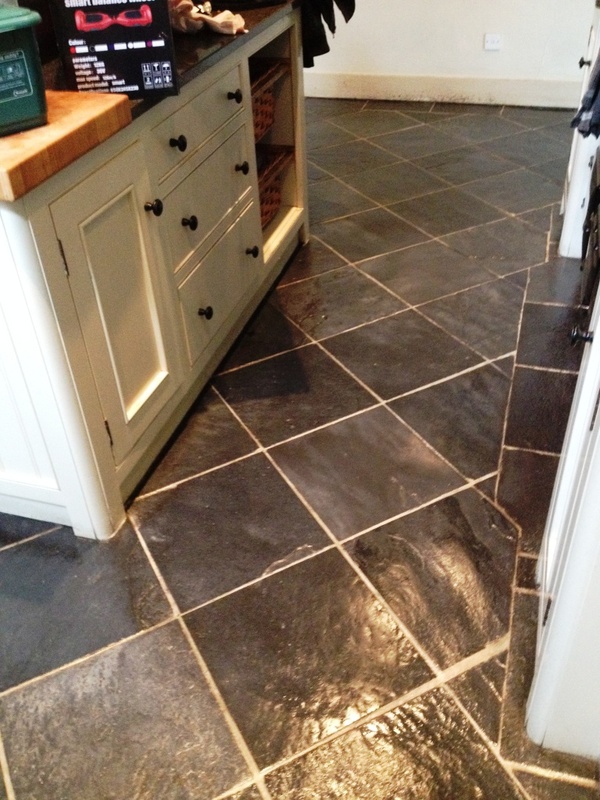 While the popularity of the material perhaps peaked a hundred or more years ago, punctuated by the so-called “Slate boom” in 1870s Europe, it is still seen used en masse in large construction projects globally, and Slate tiled floors remain a feature of many houses in the UK, both old and new. 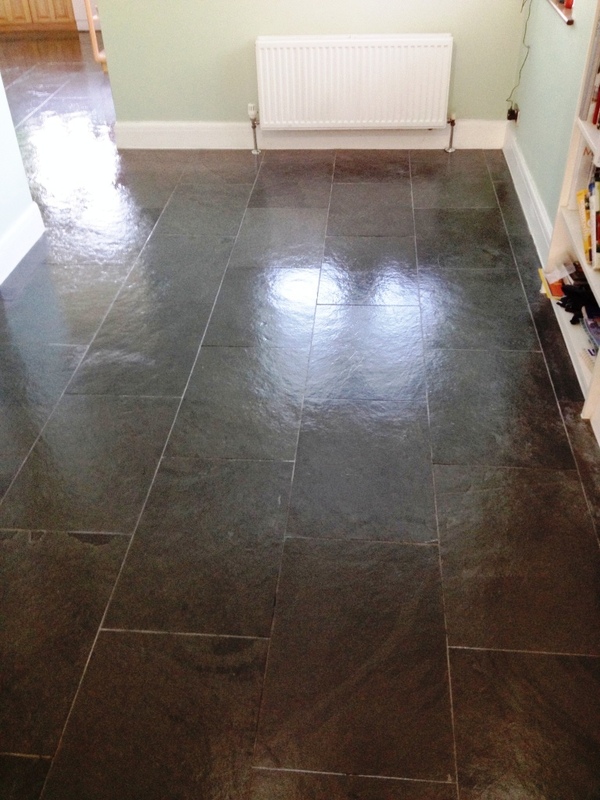 Despite its natural durability, Slate still requires regular maintenance, especially when used as flooring in the high traffic areas of a house. 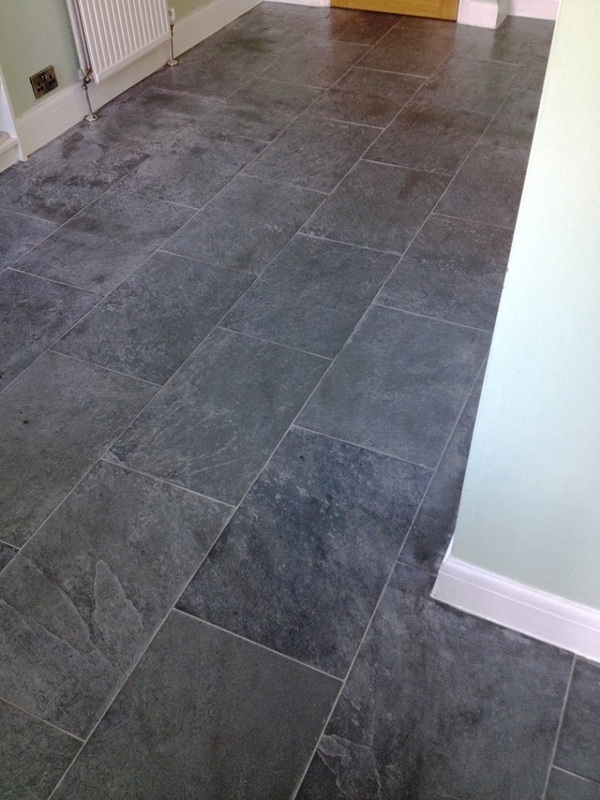 This tired and dirty looking Slate tiled floor in the kitchen of a house in Hampton, Middlesex was in certain need of the old sealer being stripped off, following by a deep cleaning and the application of a fresh seal. 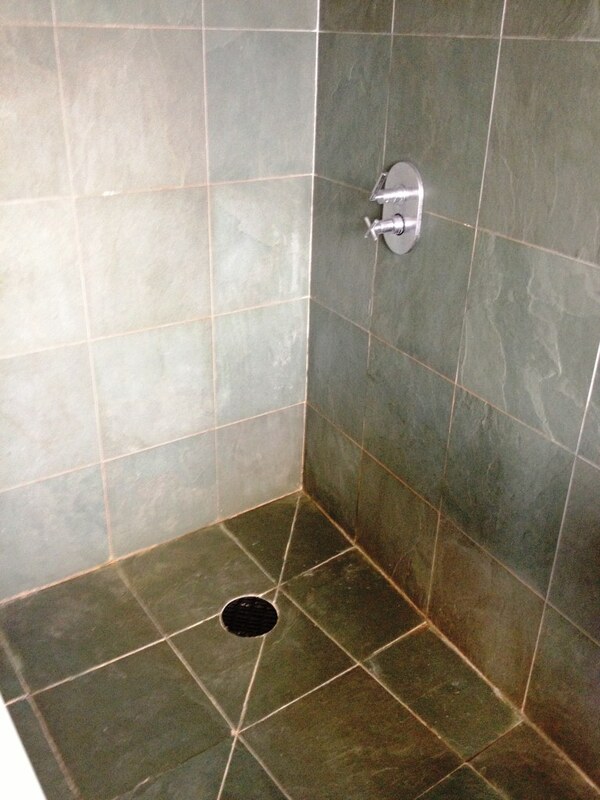 To begin the job, we mixed a strong cleaning solution consisting of Tile Doctor Remove and Go stripper and Tile Doctor Pro Clean. 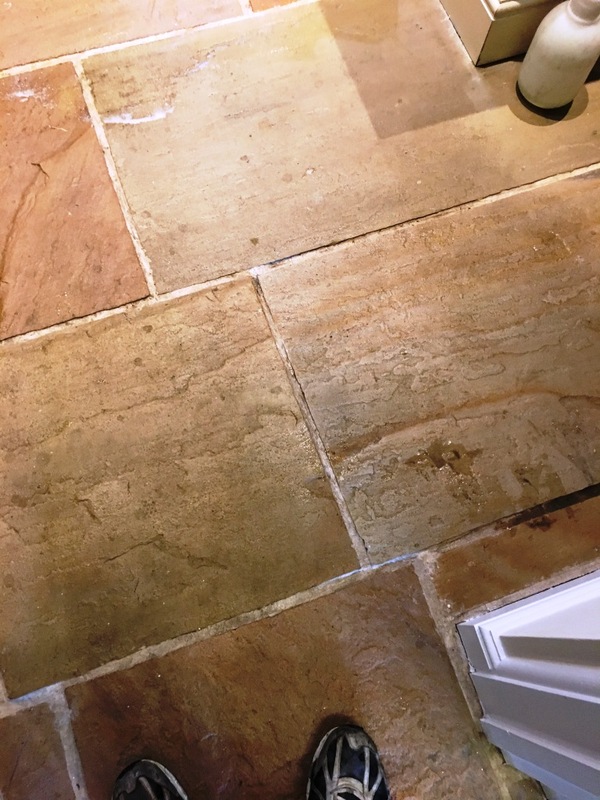 Pro Clean is a heavy duty alkaline-based cleaner that is designed to tackle significant levels of soiled build up on natural stone floors. 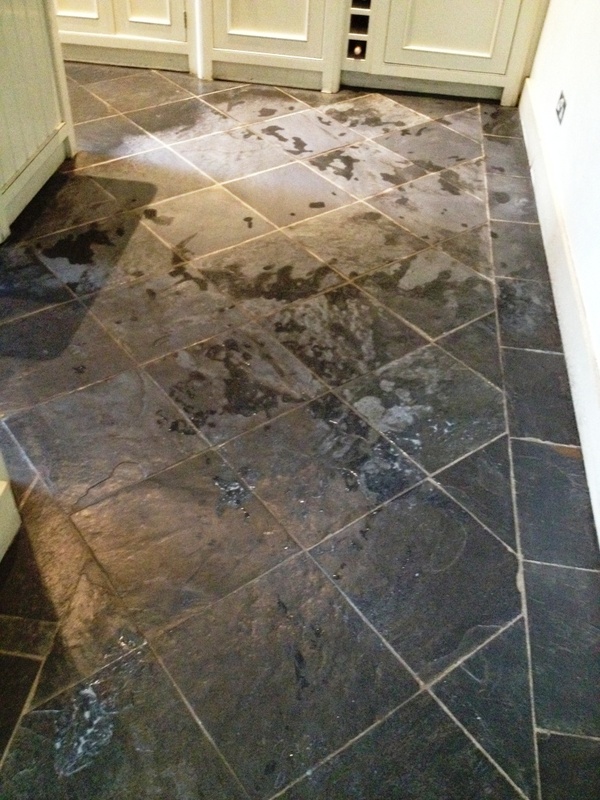 This solution was then spread evenly across the surface area of the floor and left for roughly ten minutes to dwell and soak into the Slate, allowing it to start stripping off the old sealer. Next, I fitted a black scrubbing pad to my rotary buffing machine and proceeded to agitate the solution, breaking up the dirt and general muck afflicting the tiles, as well as the old sealer. As the slurry of muck emerged I promptly rinsed it away with clean water, before extracting the excess moisture with a wet vacuum. After being left to dry completely over night, the floor was ready to receive a new application of sealer. Since the customer requested a high sheen finish and a floor that was easy to maintain, we opted to go for the solvent based topical sealer known as Tile Doctor Seal & Go. 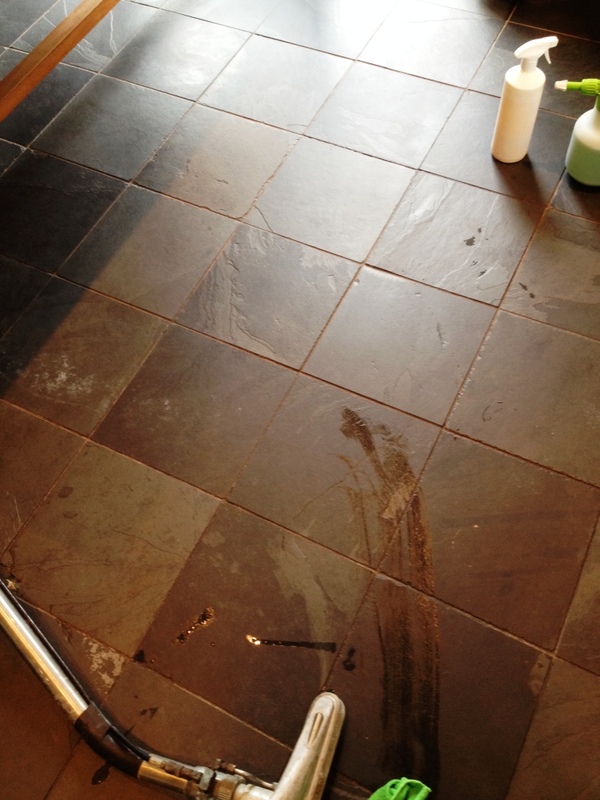 The sealer acts as a layer of protection for the floor against dirt and stains. 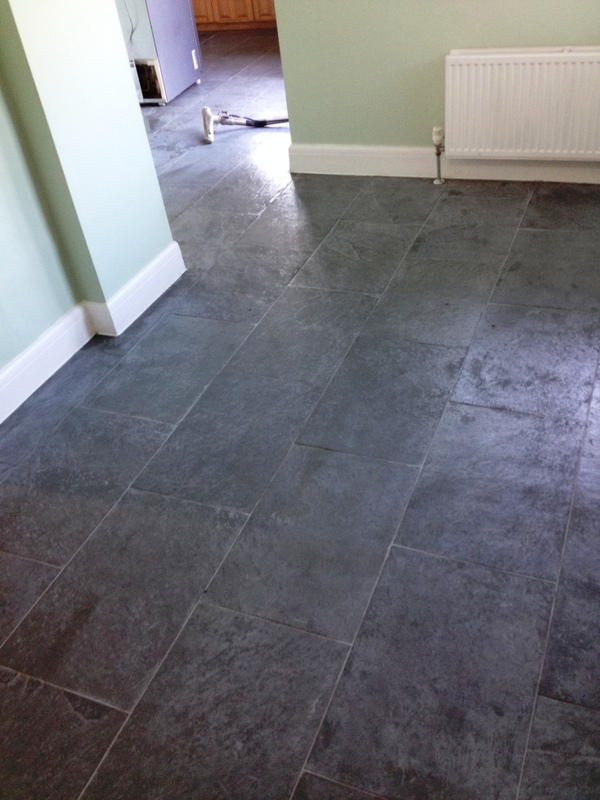 As you can see from the pictures, the restoration has fully restored the lustre to these Slate tiles and has set up floor to be easy maintained for the customer in the future. 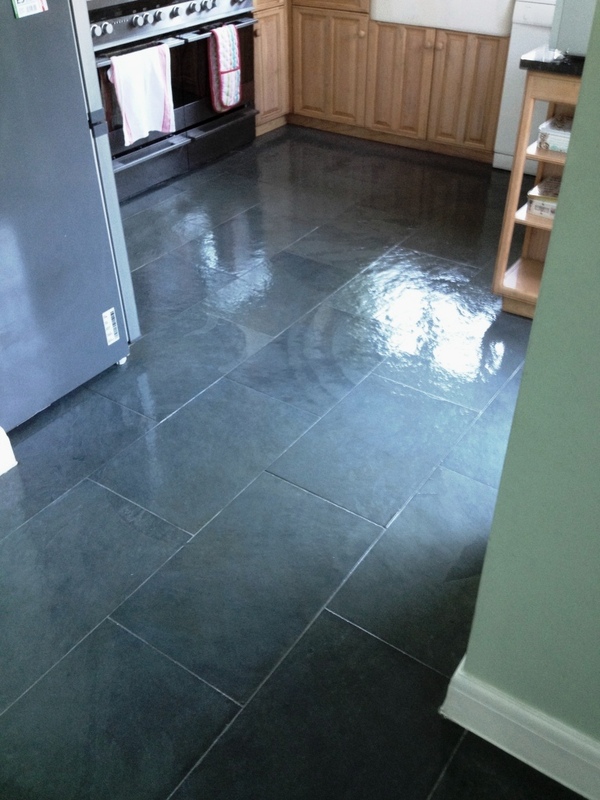 This slate floor was installed in the kitchen and adjacent dining area of this house in Shepperton, Middlesex and now as with all sealed floors the sealer had worn down and the floor was becoming difficult to clean leaving it looking dull and uninviting. 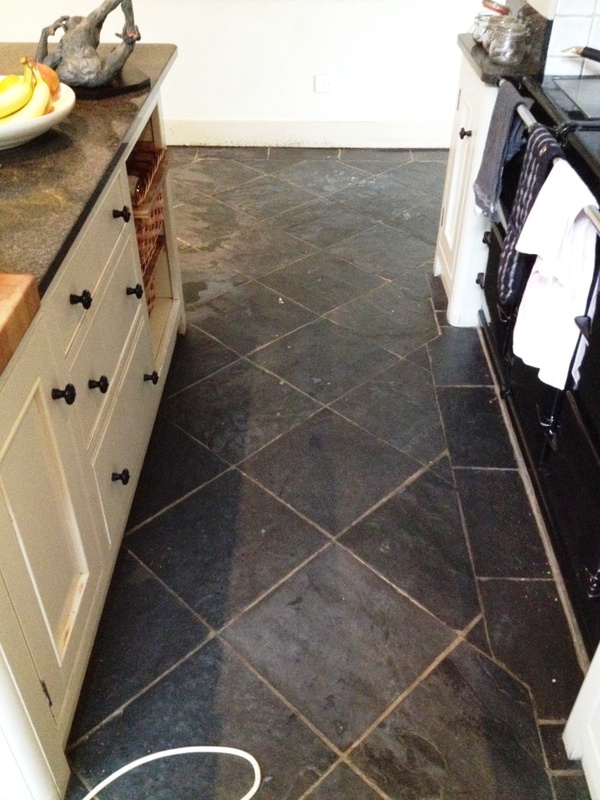 To remedy the old sealer would need to be stripped off, the floor deep cleaned and a fresh seal applied. I suspect the sealer had been eroded prematurely by the use of harsh cleaning chemicals and a steam cleaner. This had destroyed the sealer in parts and made the floor look very uneven. 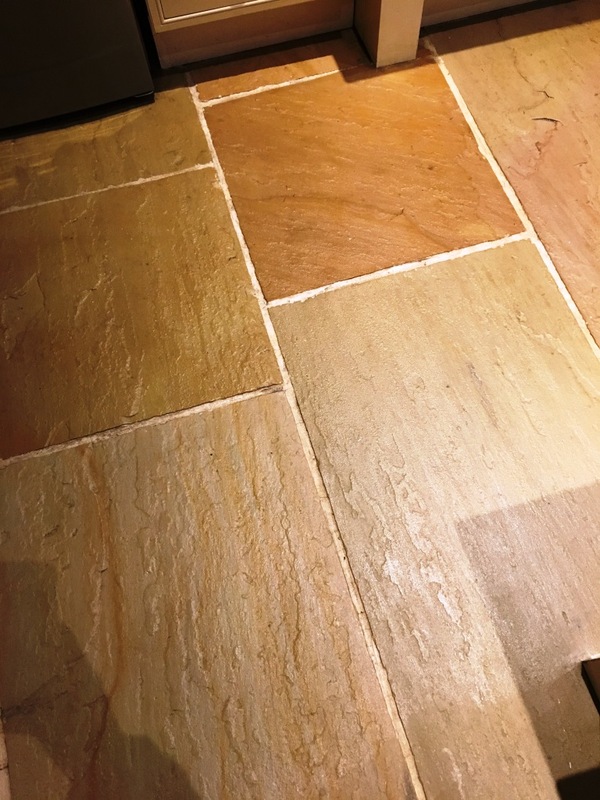 You do need to be very careful of supermarket cleaning products as many are designed for glazed ceramic tiles and contain acids which will eat through the sealer over time. 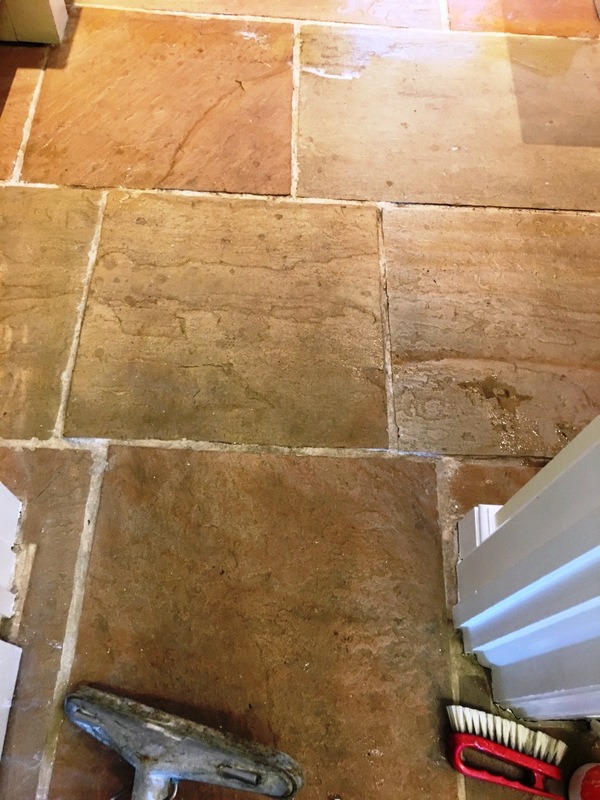 To strip the remaining sealer off the floor and give the slate and grout a really deep clean I prepared a 50:50 mixture of Remove and Go and Pro-clean diluted with water. 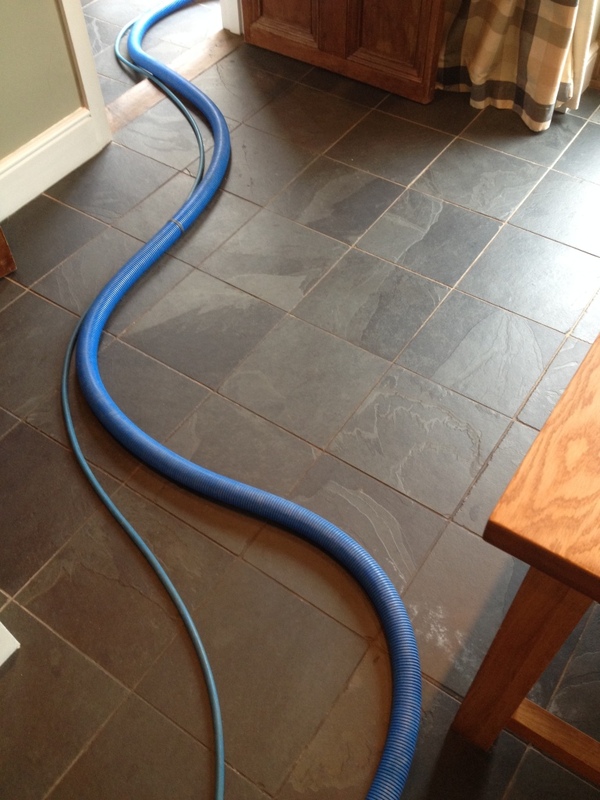 This powerful stripper/cleaner solution was then machine scrubbed into the floor to break up the dirt and old sealer, a stiff brush was also run over the grout lines to get them clean as well. The slurry was then rinsed with water and extracted using a wet vacuum. 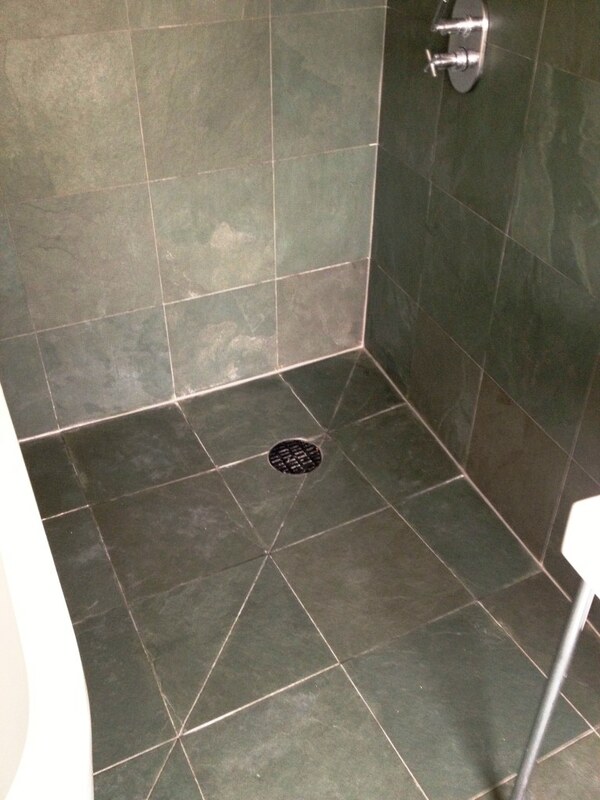 The floor was then inspected and the process repeated where necessary until I was satisfied the slate and grout were as clean as they could be and free of any old sealer. The floor was left to dry off and we returned later to seal the floor. 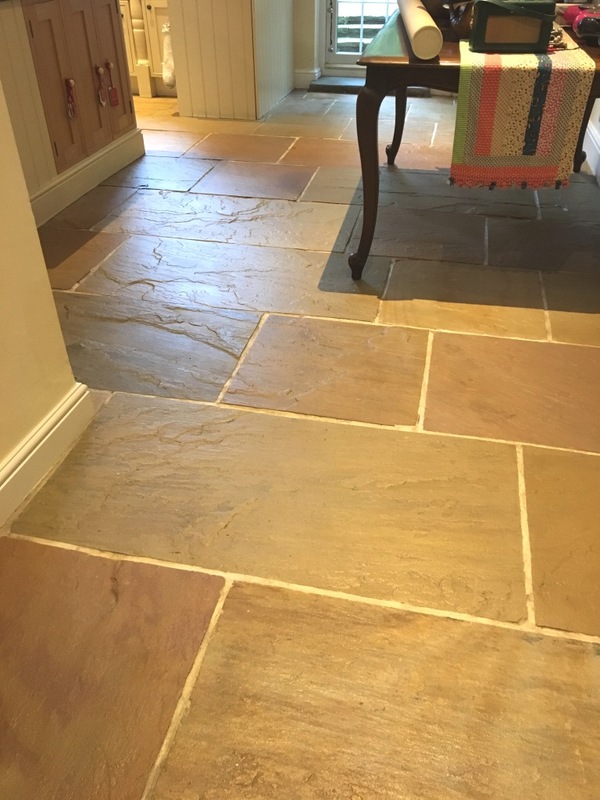 Sealers can be affected if the floor is damp so a damp meter comes in very handy at this point to confirm the floor is dry before sealing. We have a number of sealer products available that all have different effects and in this case the customer required a high sheen finish and a floor that was easy to maintain. 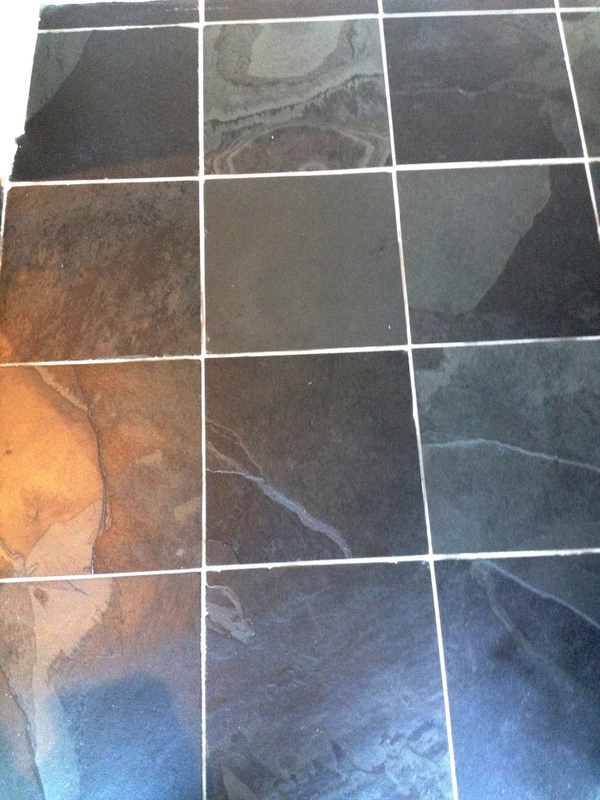 Tile Doctor Seal & Go gives exactly that result and being water based it doesn’t leave a smell as it dries, so we applied a number of coats and provided the customer with some advice on the use of pH neutral cleaning products for general cleaning going forward. 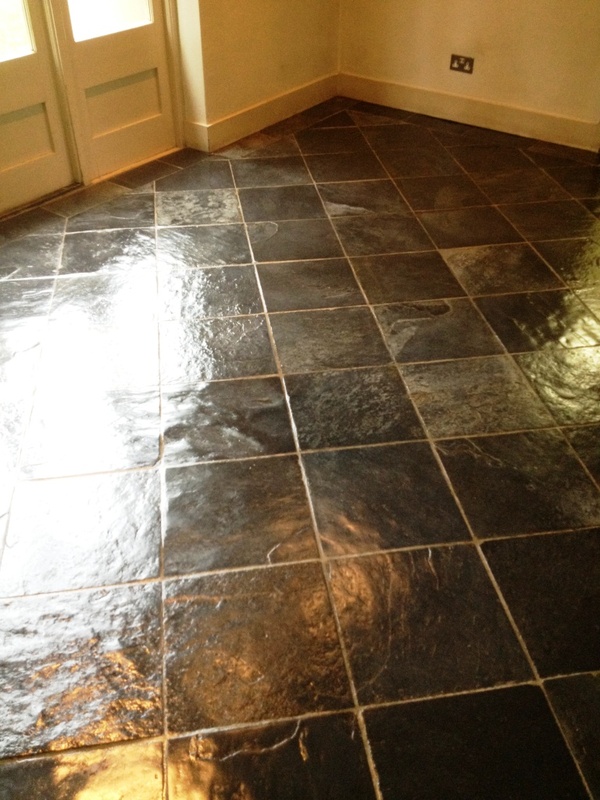 You can see from the pictures that the process has restored the lustre to the slate and the sealer will protect the floor going forward making it easier to maintain.